Hello, lovelies~ My favorite foundation thus far has been from Revlon Colorstay Liquid Foundation for Combination Oily Skin. A few weeks ago, Revlon released their new Whipped Creme Foundation in Jakarta. Being a foundation junkie, I (of course) went and bought it in the shade Natural Beige. Right off the bat, the packaging is heavy. The foundation is sealed in a glass jar with a black twist off lid that attracts a lot of finger print. I'd usually wipe the lid with a tissue after using this foundation, but that's not a problem. Once the lid is opened, there is a white separator that keeps the foundation clean. Unlike most lids, there is a groove where my fingers fit nicely to pinch it when I want to open the lid. The only problem with the packaging is how heavy it is, making it hard for me to travel with it. Not only that, it takes most of the space in my makeup bag. The texture of the foundation is similar to a whip cream after it has been whipped into an almost stiff peak. Hmm, it's almost like the texture of butter when it's room temperature. Soft but not melted, as seen on the picture below. The shade I bought is in Natural Beige, which isn't the exact match for my skintone. You really have to swatch this on your hand because the colors in the jar may be deceiving, as they tend to look a lot lighter than the product. Once I dot it on my face, I noticed an unpleasant scent coming from the foundation. For me personally, I feel that it's quite strong, even when blending the foundation, it's still there. However, if you don't have a sensitive sense of smell, I don't think it would bother you. After blended evenly all over my face, I noticed that it has a medium coverage and is able to concealmost of my mild acne scars and redness on my cheeks. It has a semi matte finish on my face, which is great for those wanting a little dewy glow in their makeup. One thing that annoys me is the slightly greasy and/or sticky finish once I finished blending all of the foundation on my face. It isn't like the Colorstay Liquid Foundation where it sinks in almost instantly when blended. This foundation lingers on my face, leaving an almost sticky finish on my face. The creme texture is possibly one of the reason why it feels sticky, I think. I dislike the feeling of foundation clinging on my face and doesn't feel like second skin. I like a foundation when it just sinks in and I forgot I was even wearing foundation. Sadly, this foundation is nowhere near lightweight on my face. 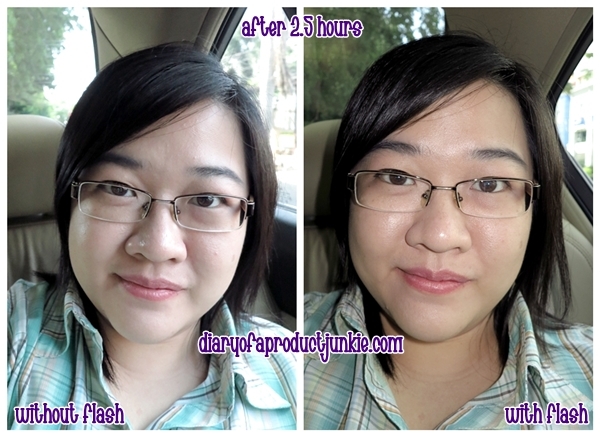 As for the staying power, it lasted around 4 to 5 hours on my face with only one layer applied. I can't imagine applying another layer when one layer is already that 'heavy'. 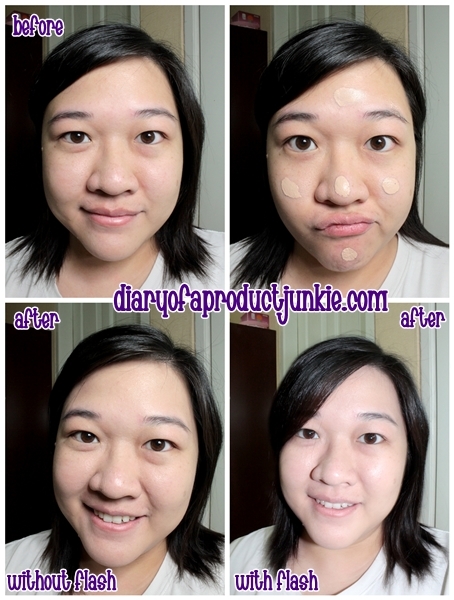 The oil control is average even when set with a powder afterwards. It was around 2 hours until I saw oil leaking from my T zone. I have an oily skin type, FYI. See my nose and forehead looks slightly greasy on the picture below? Overall, I was a bit disappointed by this foundation because I find that it couldn't compete with its relative the Colorstay Liquid Foundation. I find that the semi matte finish is lovely on pictures, but the slightly sticky feeling turned me off from using this foundation. I favor the texture because I feel that it easily blends into the skin, but it feels clingy on my face. I'd think it would look good for people with normal and/or dry skin since it is a creme texture. In short, I like how it looks on pictures (without flash, preferably), but I hate the feeling on my face. iyaa, pas coba swatch di counter ternyata feels sticky! malah langsung ga suka. eventhough everyone raved about this, i think i won't purchase this. uda yakin ga cocok. tapiii.. bole tu fan kalo km mau share ke aku. penasaran juga si. ahaha.. great review as always, phanie! I have this foundation and it made me break out! :( After I started to read reviews one this after I bought it I think these foundation runs light. I even bought the wrong color. He eh, Del, kepengen banget cocok, tapi yah kulitku berkata lain.. Aku masih lebih suka yang liquid foundienya. The best! Sama, aku lihat peragaan dr stella kayaknya oke.